Is Your Garden A Danger To Passing Pedestrians? 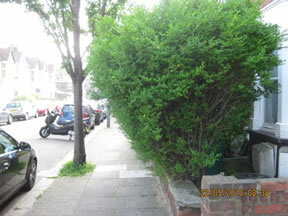 Anyone who wishes to report a tree or hedge overhanging the public highway should telephone (020) 8871 6708 or dtsonstreetservices@wandsworth.gov.uk. Residents with front garden hedges, trees or bushes are being asked to keep them under control as part of a campaign to reduce pavement hazards for blind and disabled people. Groups representing disabled people have asked the council to encourage householders to keep garden vegetation properly trimmed and prevent it from encroaching onto pavements and footpaths. Hedges or trees that are left unchecked can pose a serious hazard for blind and partially sighted people and also for people who use wheelchairs. Surveys have found that 95 per cent of blind or partially sighted people cite overhanging vegetation as one of the biggest problems they face whilst walking. Now the council is calling on households with hedges, shrubs and trees to make sure they are pruned regularly and not left to grow out over the public highway. Council leader Edward Lister said: "This is a major problem for blind and disabled people and it can also present difficulties for parents pushing young children and babies in prams and buggies. "I would urge anyone with a front garden hedge or tree near a footpath to regularly cut this vegetation back and keep it in check. This simple act of good neighbourliness will do a lot to improve the quality of life for disabled people and those who are blind or partially sighted." As well as appealing to owners to take action, the council is also urging local people to report examples of overhanging foliage. Households with branches or hedges that are overhanging the public highway and posing an obstruction will then receive letters asking them to cut these back within 14 days. If the letters are ignored, the council will carry out the necessary work and bill the owners.